Over the summer I found myself with some spare time and an over active imagination. So I came up with a few what-if engines, some of the dimensions might be a little off as I haven't used trig for about 25 years since college. • Type: 16-cylinder, supercharged, liquid-cooled, 60° V, piston aircraft engine. Brilliant idea. Now all we need are some what if drawings to fit them. As Greg sez, interesting notions. more than just the depth of the added row(s), or it may not. in length, however many R-4360 installations longer, 130" in the case of the Boeing XF8B-1. Also the overall length of the Hercules itself varied by mark/installation. power-egg installation, which includes the cowling. If I recall AGRA pointed out in an armour related thread that a cloverleaf arrangement, using a single crank, of three DH Gypsies was planned for evolved Sentinel tanks. How do you feel about a Napier Sabre H-48? Yes, the Gypsie was meant to be a more powerful replacement for the Cadillac model. I have no idea if there was even a prototype, I suspect it was only a paper design or proposal. All the original dimensions used as a base for all of the above were lifted from Wikipedia, with some help from my Lumsden’s (Lumsden, Alec. 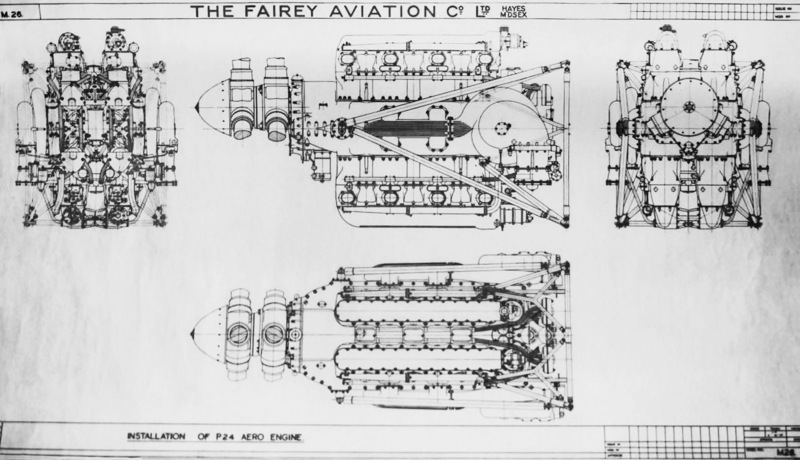 British Piston Engines and their Aircraft. Marlborough, Wiltshire: Airlife Publishing, 2003. ISBN 1-85310-294-6). I had hoped to work out the dimensions for a W Merlin along the lines of the Allison V-3420. But the trig was beyond me. I was aware of the Merlin H-24, trying to work out the external dimensions for this engine was the initial impetus for all of the above. I was not aware that Napier looked at a Sabre H-32 let alone an H-48. Found it, four Gipsy Major I-4, for a total of 16-cylinders, in an H layout, 410 hp. Cooling would probably have proved to be its downfall. That's going to need a lot of forced cooling to function properly; I can see several fans and some careful baffling needed. ok this was just a red wrag to a bull. Given the capacity 450hp wouldn't be beyond being achievable. The Rapier gave 350hp from 8.833 litres. I agree that cooling this thing would have been it's big draw back (tank engine compartments not being the easiest to get the air to circulate around. As an aeroengine it may well have been more successful. Very interesting article thanks for the link. Heres a thought, a RR Kestrel / Peregrine V12 tank engine to replace the Liberty earlier than the Meteor did.